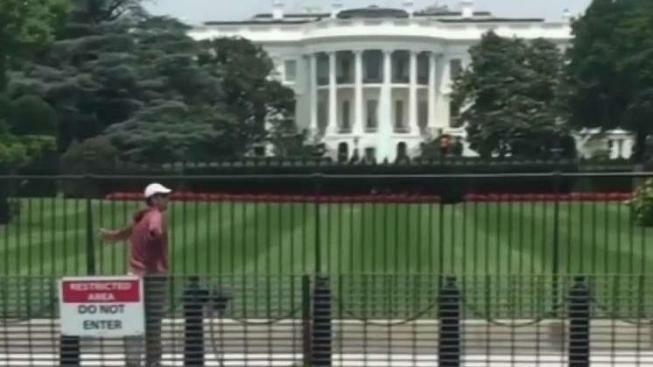 The man who jumped a fence at the White House complex Monday afternoon told police he was on a mission from God and wanted to attack President Donald Trump, according to charging documents. Alexander Thomas Miner, 29, of Danville, California, is accused of jumping a concrete barrier with a fence on top of it that separates E Street from the Ellipse on the south side of the complex despite signs reading "Restricted Area, Do Not Enter." "We were just here taking pictures in front of the White House with tons of other people, and some guy came at me kind of from my blind spot and just very calmly walked up and looked and me and said, 'Hey, do you want to see if God's real?' and he threw a backpack down at my feet in front of me," said witness Jim Tripp, a tourist from Washington state. 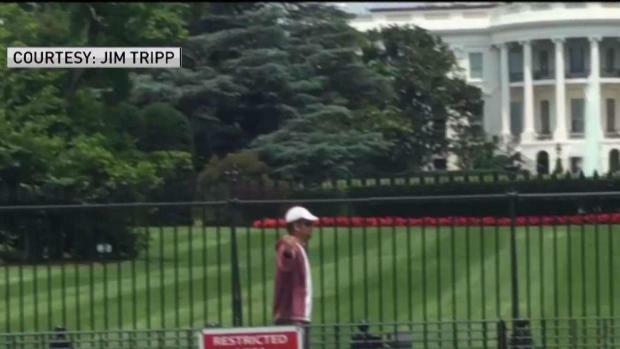 Miner walked toward the south fence of the White House with his hands in the air shouting, "Shoot me, shoot me!" according to charging documents. Secret Service officers yelled "stop" and "get on the ground" and took him into custody. D.C. police found no weapons or contraband in the backpack. Miner waived his Miranda right and told D.C. police he was on a mission from God and received communication from the birds and the sky, according to charging documents. He said had he not been stopped, he wanted to make it to the Oval Office where he wanted to slap or punch the president and "make him cry like a b----." He said he did not want to be shot by officers and he did not want to kill the president but that the president "needs to die," according to charging documents. Miner told police that before he jumped the fence, someone had said they didn't believe in God and were doing fine, and he responded by saying, "Do you want to see if God is real?" according to charging documents. Miner told police God was furious and Trump is the Antichrist, according to charging documents. He said Trump harassed him with campaign emails and Hillary Clinton and former President Barack Obama were child molesters. The Secret Service reached Miner's father in California, who said he filed a missing person report for Miner about three weeks ago, according to charging documents. He said his son was a retired Marine who went "off the deep end" and might be paranoid schizophrenic. He described his son as heavily trained, tech savvy and dangerous. A man climbed over a security barrier on the south side of the White House complex Monday afternoon, according to the U.S. Secret Service. News4's Pat Collins has video from the scene. "He’s got some serious conspiracy issues, paranoid issues maybe it’s gone from PTSD into something else," said father Lincoln Miner. "I want professional help for him to find out what's going on and I think he does too." Miner already was under investigation by police in Chesterfield County, Virginia. A woman told police there she had messaged with Miner on and off for years but had never met him until he knocked on her door about 9 a.m. June 4, charging documents said. She said there was no reason he would know where she lives. She told police she received 150-200 Facebook messages from him in less than an hour the following day. Miner is charged with a federal offense of entering and remaining on restricted grounds and a D.C. offense of attempted burglary. In U.S. District Court for the District of Columbia Wednesday afternoon, Miner was placed in the custody of the Federal Bureau of Prisons for a 30-day mental competency examination.